Watch jellyfish models swim quietly, creating a beautiful ambience. Lifelike jellyfish movements are so realistic you will question if they are real. 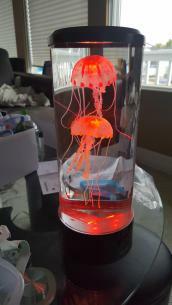 The Animated Jellyfish Lamp brings simulated marine life and colorful LED lighting to any room. A Tranquil, peaceful, soothing beautiful deep-sea environment for home or office. 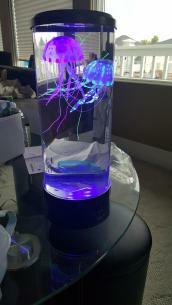 The Lamp comes with 2pcs life like Jellyfish with 18 LED lights(6pcs Red, 6pcs Blue, 6pcs Green), 5 color light changing effects.